No matter what channel you switch over to, you're bound to land on a real-life reality TV show such as Cops, Motorway Petrol or more importantly, Chopper Rescue. Fortunately Chopper Rescue is an Australian produced ABC series that throws the sensationalism out the window and revolves around the crews of Emergency Management Queensland, a 24x7 emergency service who use helicopters to transport patients. Based in Cairns and Townsville, they are dictated by doctors, paramedics and other emergency services as fly their victims to the nearest hospital for the much needed assistance they need. The charm of this series is that the viewer is also given a snapshot of the people who sometimes risk their lives for others and some of the chopper rescues are quite difficult due to cramped conditions. The most memorably episode is of a ghost ship sailing in the Northern waters of Queensland that appears to have nobody onboard. At times, Chopper Rescue plays out like a documentary series that adds a healthy dose of drama into the mix. The episodes are quite diverse and the first episode revolves around a man with acute pancreatitis and needs to be transported from a remote satellite hospital in Mareeba to a larger medical centre that have the equipment needed to save his life. Episode two requires the crew of the EMD to accompany a very dehydrated baby from the remote town of Hopevale in Northern Queensland. The second part of this episode requires the team to attend a serious car accident on Magnetic Island and due to the limited amount of resources, their job becomes quite difficult. 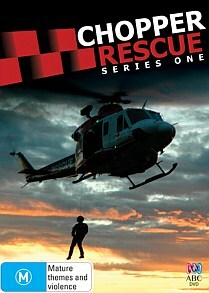 With only four episodes on this collection, Chopper Rescue is a well produced series that gives the viewer enough information without it being overbearing or too commercial. It's also quite fascinating to watch them work on their feet because sometimes they need to juggle their priorities, including those of their clients such as a young boy who is injured by a motor vehicle and is forced to be carefully be moved to Cairns hospital for fear of spinal injured. And then these brave heroes have other obstacles in their way such as the weather and the remoteness of many of their rescues that can be quite difficult for them to get to their patients. Another highlight of the series is that there is a follow-up to the patients that nicely ends their story. The only downside of this series is that is quite limited with only four episodes. Hopefully the ABC will release additional instalments of this interesting and captivating TV series. The video and audio quality is quite average for a TV produced series but fortunately the drama of the incidents more than outweigh for this lack of quality. Definitely a series recommended to those lovers of reality TV!